is situated in an area which is physically sealed off from “worldly” influence. eight in total, are placed in the cardinal and inter-cardinal directions. Nimit. The word "nimit" is of Pali/Sanskrit origin and stands for "Sign". 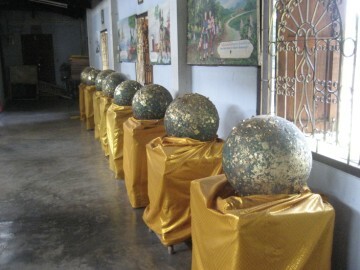 These "nimit"
have the form of a sphere, looking a bit like large cannonballs. 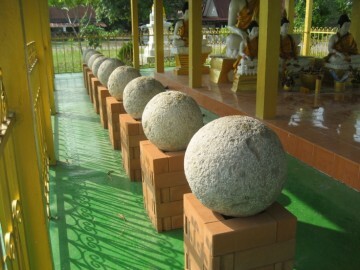 ubosot, under the location of the principal Buddha image. 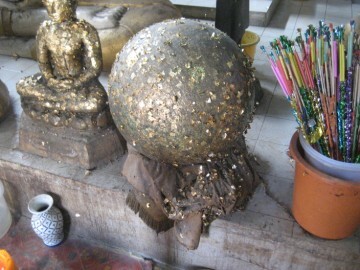 of the Buddha and to stick some gold leaves on the stones. The spheres are buried, on a well chosen prosperous day, underground in cubic pits. 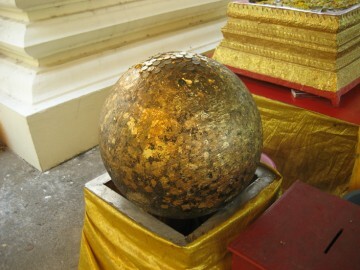 the pedestal from the main Buddha image. is cut, by an important person (who accumulated a lot of merit) with a ceremonial knife. 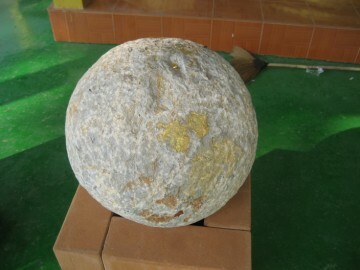 symbolic seed, is sealed in the heart of the ubosot. 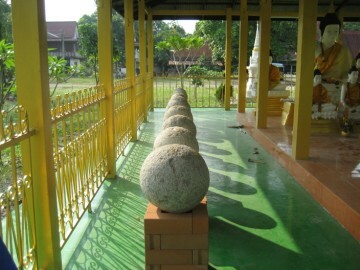 the sacred area. It was though not only a sacred area, but also linked to asylum rights. by tying a thread from the temple to the city wall in order to protect the city from attack. the Buddha, when somebody sought refuge in a Buddhist monastery and was not harmed. Racha Praditsathan against the abuse of power of Queen regent Si Sudachan. resolved, he went out to be ordained as a monk at Ratchapraditsathan Monastery. king who sought the sanctuary of a monastery. 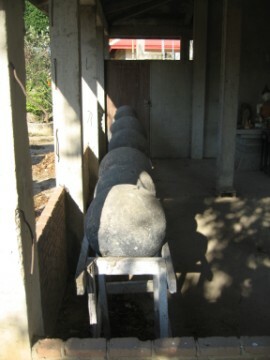 Sri Ayotchiya monastery, and came to reside in the Pradu Rongtham monastery. (2001) - page 111, 112. Lotus, Bangkok. – page 298, 299.